Last week, I had a busy week at work – lots of meetings meant lots of note taking and lots of minutes. I have discussed before the professional use of notebook with exercise books (and counsel notebooks) coming out top for the day-to-day work. Today I am having a closer look at the “Day Book”. A fantastic tool for carrying around to all your meetings, and simply to add to day by day. I’m sure most people in the working environment have a book that falls into this category or even in the more creative fields this will come in the form of the ideas notebook. 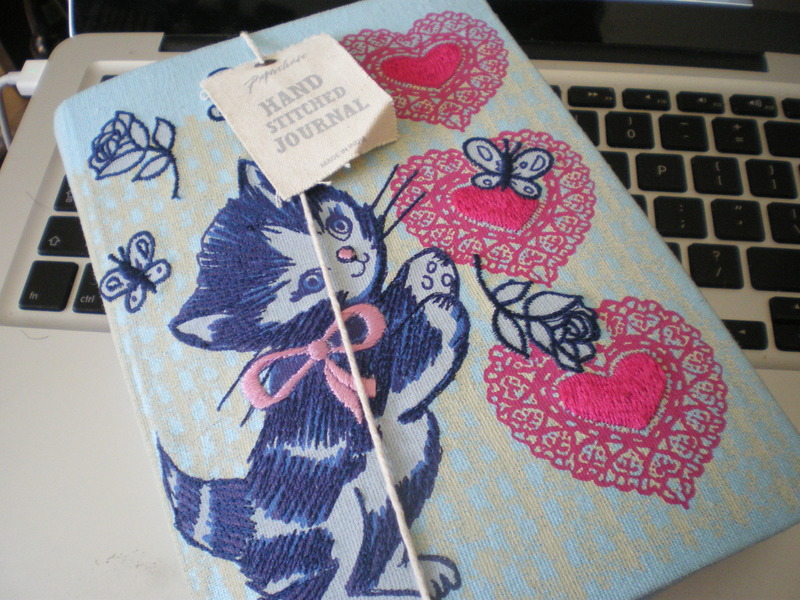 My Cat notebook (Pictured) seems to have fallen into this category this month. The Day Book however is not without its problems. It requires reviewing! It is no good to just continually add to it. You must look back to your ideas, learning points and outcomes. All these will need a further action on your part and sometimes it is quite easy when busy to overlook things. Stop. think. Do you currently have a system for getting the detail out of your day book/ideas book? and is it effective? I don’t want to have to sit down and take the time “copying out” of the day book (this defeats the purpose of the day book) but you can have a more organised way of processing your information. Obviously everyone’s idea of a working journal / day book or ideas journal reflects their needs and I cannot possibly cover all these here – but here are some tips to help you maintain a more organised day book. Write a date and “title”/explanation on every entry. When writing a new entry take a new page (leave some white space for additional annotations and comments). Write out what course of action you need to take – number these. dictate what needs to be done so you don’t forget. Develop a routine, or a style to your notes so you know where to find things. It is useful to have everything in a similar format. Review and improve this periodically. Change your handwriting to add emphasis to different sections of your writing if you don’t have more than one colour of pen or highlighters. Don’t be afraid to staple / stick in loose pages and bits and bobs (anything that saves time is worth your while). Do a line down the margin to make any information you want to extract from the notebook. Develop a habit of reviewing the day book. E.g. at the end of each day or when you usually review your to-do list. Copy across any important dates into you calendar so you don’t forget them. Put numbered items into to-do list, schedule if possible. Follow up the to-do items. Day book items should usually be done that day. Re-read/flesh out notes and don’t be afraid to annotate. Do the research – if you wanted to check something / look something up do it, and note the answer in your daybook. Tick things off (or cross them off) if you have completed a task / or don’t need it anymore. Some people like to strike off a page. Use post-its to help you find important information/pages in a hurry. Extract any information that you have marked for extraction – such as information you want to type up, email to someone or simply add to another notebook for a specific purpose. Feel free to share your own tips in the comments.